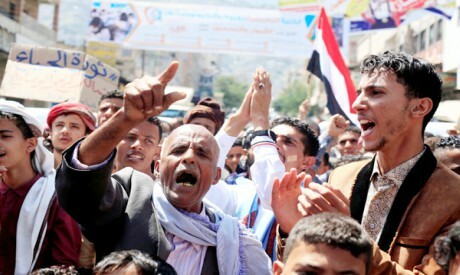 On 6 October, in Taiz, the liberated areas in the south and other parts of the country, demonstrators filled the streets and squares to protest their humanitarian plight. The major exception was Sanaa, where police and military forces were deployed throughout the city and its inhabitants warned that demonstrators would risk the harshest of penalties. Many students at Sanaa University were rounded up on campus in another measure to muffle the hungry in the capital. It was the women in Sanaa who defied the weapons and risked their lives to demand the right to life for their children who are starving to death in their arms. Hunger has rendered Yemeni women fearless of death which, in all events, is the environment in which they live. Houthi forces responded by rounding them up too. Fifteen women were arrested, which brought their parents, husbands and siblings to the prison gates to demand the release of their wives, daughters and sisters. The women have not yet been released and the relatives are unable to obtain news of them. Nothing like this had ever happened before in the country. The arrests stunned Yemeni society in which women are honoured and men would be ashamed to offend them through the use of such direct aggression. In addition, the “Descendants of Zainab”, the Houthis’ all-female brigade, were equipped with electric shock prods which they used to stun women demonstrators. They also stormed houses, arrested the women inside, conducted searches, and confiscated mobile phones to prevent the media and the world from catching wind of the Houthi movement’s brutality. Children are dying of starvation as their parents watch, helpless. Although the war began over three years ago, the people had not screamed their hunger in this manner before. What has brought Yemen to the brink of famine? Yemen is under a blockade by land, sea and air because of the war between the Houthi movement and the Arab Coalition. Yemeni civilians are caught in the crossfire. They are the first and foremost victims of this war. Costs of living have skyrocketed due to the collapse of the local currency which has plunged to 780 and then 1,000 riyals to the dollar, which is as unavailable as other foreign currencies. Government employees, who make up a large portion of the Yemeni workforce, have not received their salaries for aeons. The Yemeni Central Bank now has four separate administrations: one in Sanaa, one in Mareb, one in Aden and another abroad in another Arab country. The Central Bank’s move from Sanaa to Aden was one of the causes of the economic collapse, in part because the move left behind its staff of experts and specialists. It was a prime instance of the fissure and multiple bifurcations of sovereign institutions. The four separate bank administrations consume four times the revenues and do nothing to serve the welfare of the people. The legitimate government is another cause of the collapsing economy. It mints money with nothing to back it up. In the latest shipment, 24 billion riyals was unloaded at the port in Aden. This is a government, moreover, with 36 ministers, plus deputy ministers, general-directors and others, all living abroad and all receiving salaries in hard currency. As for the political parties, they do nothing for the people. The cost of petroleum derivatives has soared. Same for butane cylinders, if you can find one. The state of humanitarian aid is chaotic. Some international organisations target certain sectors, such as widows or orphans. Other international organisations distribute relief quotas, but without engaging local organisations, with the result that the relief is not reaching its intended recipients. The King Salman Fund also furnishes assistance that does not reach its intended recipients. Some local organisations operate on the basis of nepotistic calculations, so the aid is channelled to relatives, friends and useful contacts, while the rest of the millions of needy are left to face their grim fates. The situation has reached a point that demonstrators in Taiz were driven to deliver a message to the world to act, before the tragedy worsens. In Sanaa, Houthi militia forces were deployed in all parts of the capital to prevent similar protests. Everyone agrees that the Yemeni people are experiencing a humanitarian catastrophe of dire proportions. Will the Arab Coalition, as represented on the ground in Yemen by the legitimate government, take the steps necessary to remedy this situation in the liberated areas? Will those in positions of power in Yemen and abroad take heed of the humanitarian plight of Yemeni civilians who want their daily bread and do not want to see their children die of hunger before their eyes? Will relief organisations take the measures necessary to rid aid delivery systems of corruption and to ensure that aid is distributed equitably across all geographic regions and that it reaches its intended recipients? Will the government stop minting currency? So many urgent questions need to be answered for a people whose essential lifelines have been cut off.